Learn how to work with non-ferrous sheet metal to make hollow formed objects in this introductory class. Students will cover basic metalsmithing skills and techniques as related to silversmithing. 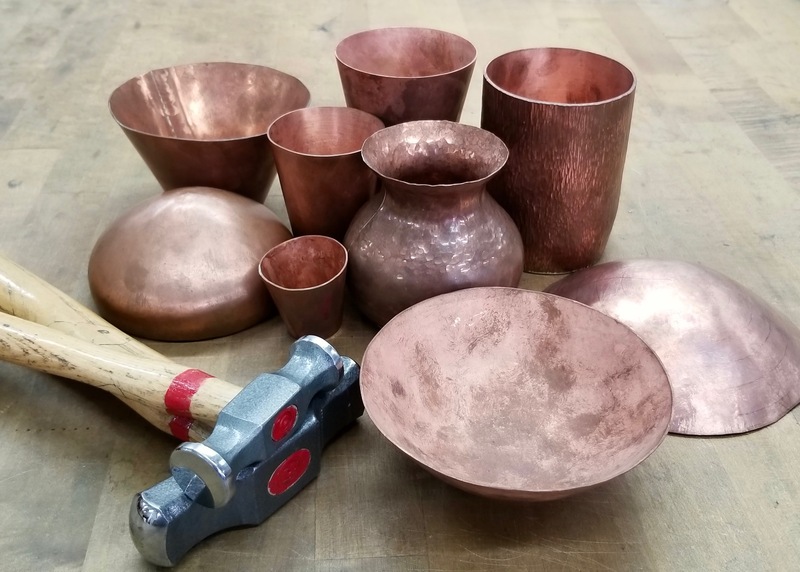 Processes will include raising a bowl form by hammering over steel stakes, footing the bowl, pattern making, and cone forms. Large scale high temperature silver soldering will be taught. Students will begin working in copper with brass as an option, sterling silver will be discussed. Maximum class size 10 students with a Teaching Assistant. All students receive a 50% discount on hourly and daily bench rentals throughout the duration of their course. Withdrawals from class 7 days prior to the start of the class will receive a full refund for the class minus a 5% processing fee. If cancellation occurs 3-6 days prior to the class, we will provide a 50% refund. Cancellations 48 hours or less receive a 25% refund. Refunds will not be provided for no-shows or same-day cancellations. We do not refund tuition for classes that students miss due to their own circumstances. Students enrolled in multi-session studio courses (excluding workshops and intensives) may make-up missed class sessions during open studio hours for up to two weeks after the last class meeting. We reserve the right to cancel or discontinue any class, in which case you may choose to receive a refund, apply the class credit towards a different course, or receive a tuition credit for future use. Tuition credits are valid for up to one year. Refunds will be issued within 30 days.